This spacious three bedroom home is perfect for a smaller family or couple who like to entertain. 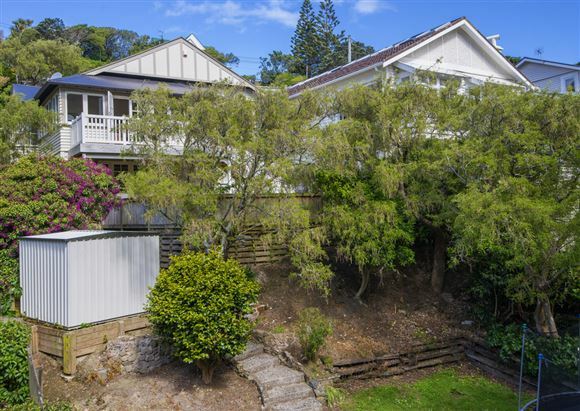 Located absolute city end Wadestown, it is zoned for Wellington's most sought after schools and the bus stop is literally 30 seconds from the front door. Fastidiously maintained and stylishly renovated, you will be hard pressed to find better in this location. Spread over two levels, the property offers a dine-in kitchen, two living rooms, three double bedrooms, and two full bathrooms. There is plenty of space for parents and children to do their own thing, or hang out together - your choice. The separate living room opens to a west facing deck, bathed in late sun, with stairs leading down from the deck to a lovely flat lawn. This in turn leads to the lower large section which has dual access to Oban Street. The options for outdoor living are numerous with two decks, a patio and two flat lawns. The section is secure and fully fenced. RV$825,000.